Complivite is a multivitamin mineral supplement designed to provide the body with the nutrients it should be getting in a balanced diet. To maintain or achieve good health each person needs energy providing nutrients, vitamins, minerals and water. Even with a good diet providing all the basics of health, there is an important role for micronutrient supplements to maintain wellness for all people. Complivite is a multivitamin mineral supplement designed to provide the body with the nutrients it should be getting in a balanced diet. 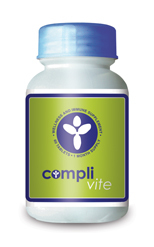 Complivite also focuses on the nutrients specifically required for the immune system to function optimally and providing the immune system with the antioxidants it needed to reduce the damage and reverse a lot of the damage created by oxidative stress (free radicals) caused when the immune system is fighting off viruses and germs. Complivite offers a complex of B vitamins, important for the immune system, energy production, cell production, renewal and function as well as nervous system support. It also contains antioxidants C, E and Selenium and vitamin D and Calcium. Complivite is basically an all in one supplement designed to give the body all the micronutrients it needs for optimal functioning of the immune system as well as assisting with energy production, and overall wellness and vitality. In addition to all of this Complivite is the only supplement that aligns with the SA HIV Clinicians Society guidelines and WHO guidelines for the treatment of people living with HIV/AIDS. The WHO and Southern African HIV Clinicians Society are highly credible, respected organisations dealing in issues of health for all people. Through intensive review of credible clinical studies and trials, they formulate best practice guidelines for people living with HIV/AIDS. In terms of HIV and other immune compromising conditions, it is even more important to look after and support the immune system as it is the bodies only barrier between itself and the virus taking over. Studies show that HIV positive people have common deficiencies of zinc, selenium, B-6, and B-12, even before their immune system becomes damaged. Antioxidant nutrients such as Vitamins C and E, to counter oxidative stress. These protect the body – including both the immune system and the liver from harm. The SA HIV Clinicians Society Guidelines recommend a combination of vitamins B1, B2, B3, B6, B12, C, D, E, and Folic Acid as well as Selenium, Zinc and Calcium. They also caution against high levels of certain micronutrients such as Vitamin A, Iron and Zinc as this can infact lead to progression of the disease. Complivite is specifically aligned with the guidelines of the clinicians and is designed to support the micronutrient needs of people living with HIV/AIDS in Africa both pre and during HAART. Complivite is approved and used by many major medical aid schemes on their chronic HIV programs; doctors, and nurses in onsite corporate primary and occupational clinics. They have seen great benefits for their patients and continue to trust Complivite to help support the immune systems of those living with HIV/AIDS and those with immuno suppression. For children and pregnant woman we recommend that you consult with your doctor before taking Complivite. Pills: 2 Tablets once per day or as directed. Complete Immune is a multivitamin mineral supplement with added immune modulators and strong antioxidants designed to provide the body with the all the nutrients required to effectively support and help build up the immune system.